So, here’s what I want you to do. Read the below recipe my comments on it. I will give away the remaining two coupons for free cream cheese to readers. – One coupon will go to the person who gets the most folks to come check out this post and say “[Enter referring reader’s name] sent me here and here’s what I think of the recipe: [ enter comment].” If there is a tie, one person will get a coupon for free cream cheese and the other person will get a Philly Cream Cheese recipe book. – One coupon will go to the first reader who makes the recipe below and posts a blog post or online photos with the evidence. Come back here and comment with link the blog or the photos (must be publicly viewable). Notes on the below ingredient list in italics are mine. I understand Kraft Foods wants you to use their products, but the only branded product below that affects the end result here is the cream cheese. Use Philly. 1. Cook the beef in a 12-inch skillet over medium-high heat until well browned, stirring often to separate meat. Pour off any fat. 2. 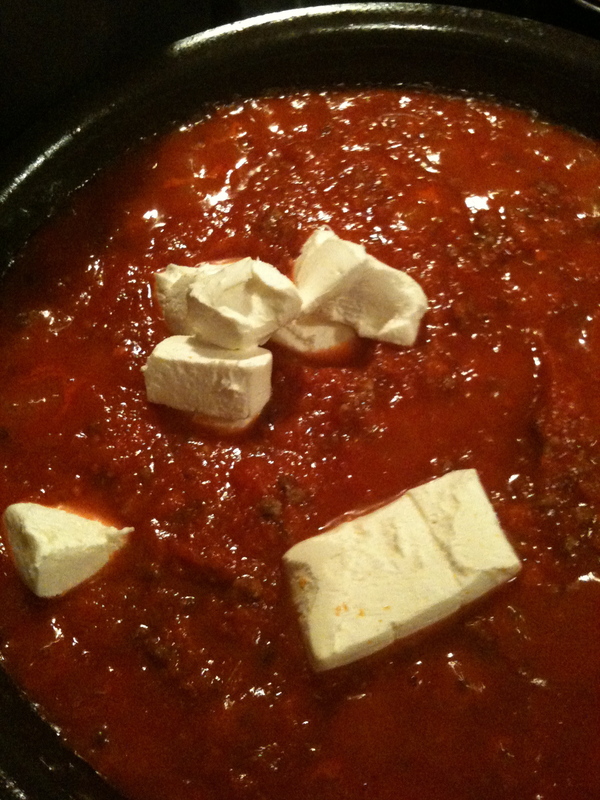 Stir the sauce and cream cheese in the skillet. Reduce the heat to low. Cook for 3 minutes or until the cream cheese is melted, stirring often. 3. 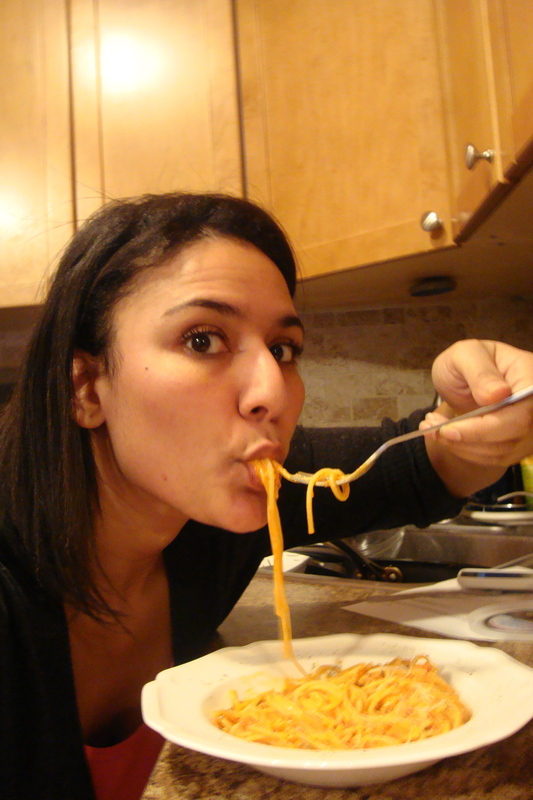 Place the spaghetti into a large bowl. Add the beef mixture and toss to coat. Sprinkle with the Parmesan cheese. For a Philly Cream Cheese how-to video for the recipe, click here. The ingredients, with the key ingredient running the show. My review below, with answers to @LoveMyPhilly‘s questions. • Did you find the recipe easy to prepare? • Did you alter the recipe at all? If so, why? Did you find changes were necessary or was it a matter of preference? Yes, I varied the brands of sauce and parmesan cheese due to personal preference. I used San Marzano tomato sauce because they’re the best tomatoes and I didn’t have time to make my own. 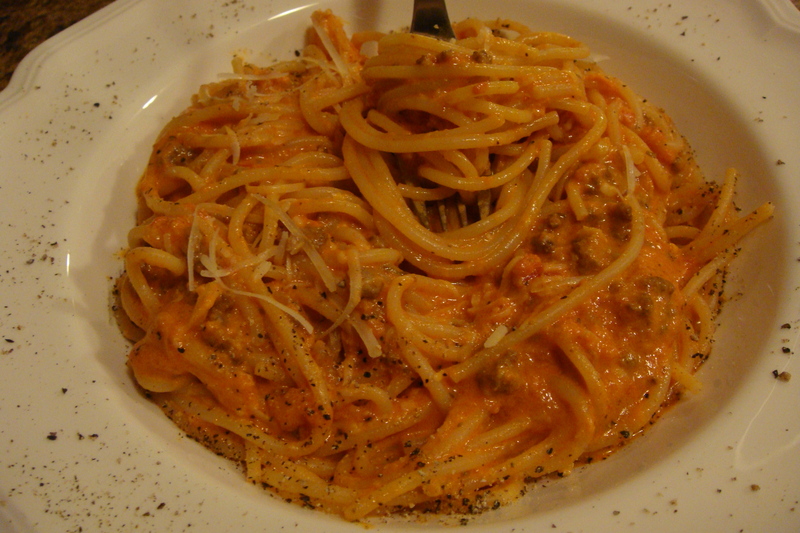 I used fresh grated parmesan cheese because it tastes better to me. I also used a lot of freshly ground black pepper, also just a personal preference. I used a 1/2 lb. of beef instead of the full pound. I generally think the less meat you can get away with in dishes with other components, the better. I found the sauce was sufficiently meaty. • Did you enjoy making the recipe? Yes, quite a bit. It took longer than I expected for the cream cheese to melt into the sauce, but I was kind of fascinated by watching the sauce thicken up when it did. • Did you and your family enjoy the taste of the recipe? I’m a family of one, and yes, I enjoyed it very much. I brought the leftovers to work for the next couple of days, and it was just as delightful the second time around. • What did you and your family like about the recipe? The cream cheese really rounded out the (slightly spicy) flavor of the red sauce. It clung to the al dente noodles much better than it would have if just using marinara sauce. • What did you and your family dislike about the recipe? Nothing. I’d make it again. • Would you make this recipe again? • Would you recommend this recipe to friends? I’m recommending it to over 3,000 people right now who are reading this blog, on my Twitter account, who follow me on Tumblr or who are friends I know in person connected to me on Facebook. Other recommendations from friends on ways to use cream cheese. Cover in Fischer & Wieser mango habanero or raspberry chipotle sauce and serve as an app with crackers. Mix one brick of cream cheese with 1/3 lb. flaked snow or king crab meat (or even immitation crab if you’re desperate) and 1 tsp. each cracked black pepper and garlic powder. Serve as an app with crackers or, much better, use as a stuffing for grilled jalapeno peppers. You’ll need a pepper rack for that to keep the stuffing from falling out. Hammer out filleted dove or duck breasts or boneless chicken thighs until uniform. Salt and pepper to taste. Place a slice of purple onion, a slice of jalapeno and about 1 Tb. cream cheese on meat, roll it up, skewer the rolls with cocktail picks and roast in a 400*F oven until done. Mix cream cheese, smoked salmon and caramelized onions in a bowl, then cover half a flour tortilla with the mixture, fold over and cook on a comal or griddle until golden brown. Cream cheese, a can of chicken (yes, can o’ chicken), packet of ranch dressing and pecans. Roll in ball and serve with crackers. Seriously, it’s good. For Christmas I made a cranberry cheesecake. Make the original cranberry sauce (cranberries, sugar and water) and let it cool, then swirl it in the cranberry sauce into the cheesecake and bake. Its tart, creamy and sweet. Whoulda thought that's how you can make a sauce so creamy? Don’t forget to recommend this blog to a friend or to try the recipe yourself if you’d like to win a coupon for a free package of cream cheese. Enjoy, and happy cooking! 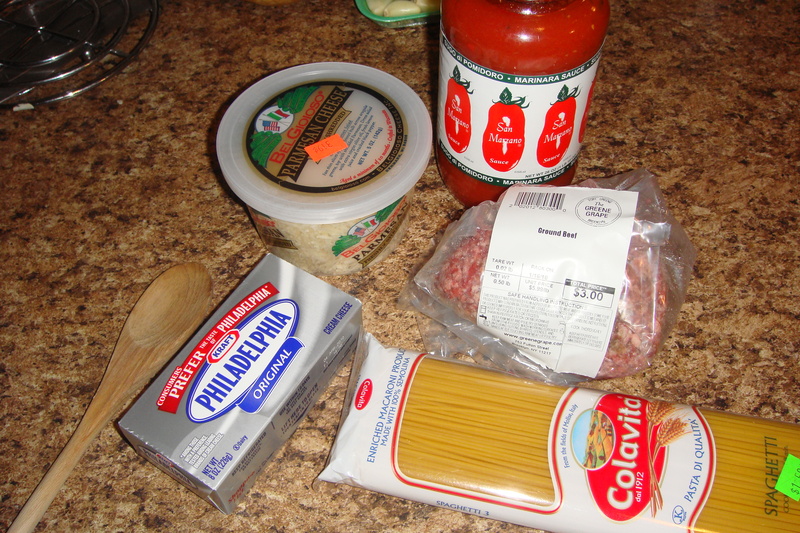 This entry was posted in Eating or Cooking and tagged cooking, creamcheese, kraftfoods, maindish, phillycreamcheese, recipes, review, sponsored. Bookmark the permalink. My Grandmother and Mother both made/make Cheese Spaghetti which is about as simple as this recipe minus the ground beef. Velveeta, Tomato Soup, Spaghetti, and pepper. My Grandmother was feeding a family of six very cheaply. Talk about simple and delicious. (As an adult quite salty but hell.) Four ingredients. 3 of which you probably have in the house. I think its a six dollar meal that could feed at least 6 people. Velveeta!! Interesting. Yeah – there is a lot to be said for families on a budget and “recession” cooking. My problem with it is that a lot of it does call for processed foods and where we are in terms of our health as a country. If we could go back to where we were before the intro of pre-packaged goods, where we were cooking cheaply with whole foods, I would be all about that. I bet you’d find it yummy! Cream cheese giveaway is my kind of giveaway! I recently made a pretty damn good sauce for a slow cooker chicken stroganoff that was *so* easy and super creamy and decadent all do to cream cheese. I love beef stroganoff! Will definitely definitely check out this recipe. Thank you, Nadia! Nice recipe. I’m going to try it this week, subbing in ground turkey & whole wheat pasta. Awesome! Please come back with a pic and let me know how you like it. I think the cream cheese will help the sauce really stand up to the whole wheat pasta. I know! But it was really, really good! I used chicken instead of ground beef and added Mushrooms…and it was delicious! That’s awesome! Do you have any pictures of how it came out? True – everything is better with cheese! I have two small children (3 and 5 yrs) and was looking for a kid-friendly recipe using ground beef and cream cheese. I saw this recipe on the Philly box but was skeptical…so I googled “Philadelphia cream cheese ground beef recipe” to see if I could find a more interesting one. I came across your review and based on your review, decided to go ahead and give it a try! I used a red sauce with lots of veggies, used small shells instead of spaghetti pasta and doubled the recipe. I followed your advice and used 1/2 as much ground beef (1 lb for doubled recipe). It turned out great but seemed a bit dry so I threw in some heavy whipping cream at the end to moisten it up. I will freeze half and bring it out one night for a work week dinner. Thanks! So happy this works for you Christy! Glad you enjoyed the recipe. Hope it came out well!